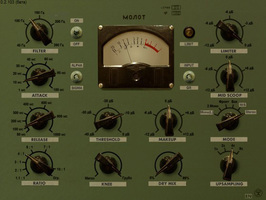 Molot, Software compressor from vladg/sound. Although all sequencers provide one or several compressors from their effect suite, most of these compressors just offer basic features and an average sound quality. Below, you'll find the finest freeware plug-ins, most of which can even compete with commercial products. Taken from Melda's MFreeEffectsBundle, the MCompressor belongs to the most comprehensive and versatile tools around if you aren't looking for a particular vintage sound or emulation. With 16x oversampling and rather powerful preset and automation management systems, the plug-in provides you with a compression ratio of up to 20:1. Add to that the freely resizable window, the M/S mode and the ability to manage up to eight audio channels for surround applications and you will surely understand how powerful this plug-in can be. The only drawback is the UI, which is a bit too jam-packed and small, as usual with Melda products. makes quite an impression with its Russian tank-like user interface and abundance of controls. But that's nothing compared to the sound it produces when you turn the 12 knobs of this compressor/limiter, which does not try to emulate any hardware compressor but is rather inspired by several well-known references, like the Neve 33609, the Tube-Tech CL 1B and the Fairchild 670. If you like discreet compression, forget about it! This plug-in was developed to give a more or less obvious vintage color to the signal ─ and even squash it like a potato masher ─ while rendering interesting musical results. Usable in mono, stereo or M/S mode, the plug-in is ideal for parallel compression on a bus. It also has an adjustable high-pass filter for sidechain use. The Molot has only one con: it requires a lot of CPU power. But now that all sequencers offer a freeze function, it's not a real problem anymore. Among compressors/effects designed to really squash the signal, you can't miss Audio Damage's Rough Rider: you'll get almost immediate results with it. We would like a Dry/Wet knob to make parallel compression (that would be more easy to use than a continuous controler). However, if you were looking for uber compression, this is the best choice. Fans of effortless processing will love the minimalist UI of the DC1A: one switch to choose between two different behaviors (cool or aggressive) and two knobs for the input and output stages... and that's it! And how does it sound? It gives you more possibilities than you expect at first sigh, even if the compression is always colored (and pumps) rather than being transparent. You can't beat experience, and the Blockfish from The Fish Fillets bundle is still a reference among freeware compression plug-ins ─ even 10 years after its launch. The fact that it was developed by Sascha Eversmeier, who is also responsible for some of the best Samplitude plug-ins and U-He's Satin, is certainly the reason why this plug-in is of such high quality. It is very versatile while remaining relatively easy to adjust. You get two different modes (opto or VCA) and all the main settings are on the front panel... Yes, there is also a rear panel that allows you to set the amount of "air" to make up for high-frequency loss due to compression. We miss an M/S mode, a sidechain and a 64-bit version, but otherwise the Blockfish is just amazing for its versatility and its ability to change from clean to dirty sounds with a single knob. Yes, the UI is awful. And yes, there is still no separate version for Mac. However, the ReaComp ─ taken from the great ReaPlug bundle ─ is one of the best freeware compressors available, especially when it comes to transparent but effective compression. The purpose here is not to change the signal like the Molot or Rough Rider do, on the contrary, the idea is to achieve the cleanest possible reduction of the dynamic range. To achieve this, you get a switchable look-ahead stage and the possibility to fine tune all parameters. Without a doubt, a top compressor. It's impossible to review the best freeware compressors without mentioning the amazing Variety of Sound where ThrillseekerLA is taken from. The name of the plug-in is an evocation to level amplifiers like the LA-2A and LA-3A, but it is not an emulation. The developer added some clever features to the basic concept: attack and release time settings, a rather comprehensive sidechain section, a saturation control and more... And like all VoS plugins, the mojo is definitely there and the result clearly recalls the sound you can get with hardware analog compressors. The only con is that the plug-in was developed with Synthmaker, which is the reason why there is no 64-bit version nor is it available for Mac. Taken from the Free87 bundle created by France-based eaReckon, the FR-COMP 87 is the small brother of the SD-COMP 87: it's based around the same audio engine and delivers the same sound, but with oversimplified settings. This makes it the perfect tool for beginners looking for a musical and easy-to-use plug-in: threshold, make-up gain and three options to control attack and release are enough to manage many applications without any hassle.